"VIII - Nachtblume" is the 8th album by the Gothic/Avantgarde pioneers from Germany, once founded by DEINE LAKAIEN mastermind Ernst Horn. It will be released in a deluxe digipak with special softtouch lamination and contains 12 all new songs. 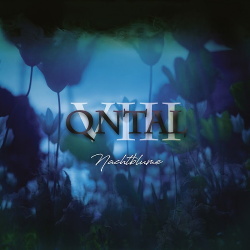 QNTAL are a household name whith their unique combination of electronic music and classical/medieval elements. A lyrical and musical journey into the era of Romanticism is the main-motif of ‘Nachtblume’ (Nightflower). Sensitivity and expertise guide these musicians on their approach to centuries-old lyrics and melodies. Transformed into modern arrangements, lyrics and melodies alike are reanimated virtuousically. Gracious artistry connects with danceable, catchy sounds, always committed to the historical momentousness of the original piece.